Elizabeth's FQ pack from SewMamaSew, originally uploaded by myittybittyquilts. So, I recently decided that I was going to make a picnic quilt for my cousin and his bride-to-be. He has two young boys involved in sports and I figured they would be spending a bunch of time sitting outside watching ball games :) I was checking out her gift registry and saw that her basic house colors were grey, brown, and green. I don't know the bride very well, so I wanted to go with the colors I knew she liked. I'm just planning to do large simple squares. Anyway, I saw that Elizabeth from Oh, Fransson had put together a FQ pack for SewMamaSew and it was just perfect! I went to order it and the site said Sold Out :( I thought I would just look for something similar and I saw the pack again in another section of the store and this time I was able to order it.. Hmmmm...not sure what happened, but I'm tickled! Not only was I able to order it, but the package was here on my door step in 3 days! Way to go, SMS! I LOVE those colors and patterns. 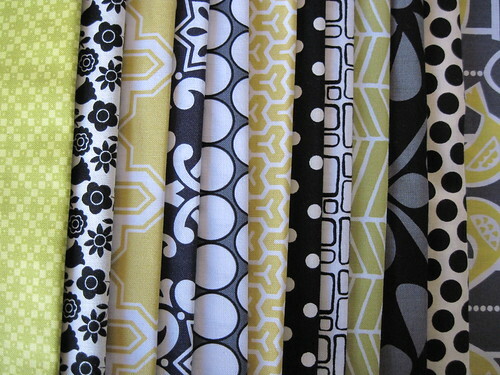 I just bought a mix of fabrics from SMS, my first internet fabric purchase. I. Love. Them. (and I love your blog, saw a link on crazy mom quilts). I can't wait to see your finished project! What to do with leftover blocks?